When Pigs Fly Returns: Ceratopsian Overload! Last week, after many painful delays, Indiana University Press finally published New Perspectives on Horned Dinosaurs, which features a crapton of new horned dinosaurs, including the much-anticipated Diabloceratops (above--image stolen from Dave Hone's blog). There's also Medusaceratops, who is known from parietals and seems like it should be included in the genus Albertaceratops; Coahuilaceratops, a monsterous chasmosaurine with four-foot brow horns; and Rubeosaurus, a centrosaurine that looks like a leveled-up Styracosaurus. But that's not all: published in journals last week, we have an island-hopping bagaceratopsid, Ajkaceratops, and a Chinese centrosaurine, Sinoceratops, who has unique forward-curved parietal spikes. So now that I know the book is out, I just have to wait patiently (PATIENTLY) for it to arrive on my doorstep. See, I ordered it like three months ago when it was 60% off. Remember that? Good times. I feel like I should point something out about Medusaceratops. According to Ryan, this new genus is actually a chasmosaurine, whereas Albertaceratops is a centrosaurine, so it seems unlikely they are synonyms. It seems the similarities are superficial. 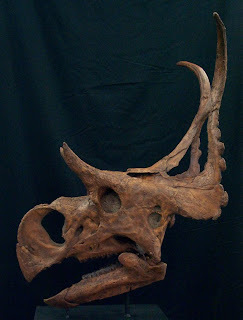 "Rubeosaurus, a centrosaurine that looks like a leveled-up Styracosaurus"